Some sunshine for a change. We have had enough rain! Temperatures today in the upper 70s. Tomorrow and Wednesday look like low 80s and back into the 70s Thursday and Friday. Bad news, 50/50 chance of showeers Wednesday and Thursday. 80s and sunny Saturday, but Sunday a slight chance of showers again with temperatures remaining in the low 80s. Fast, non-stop water generation for the past four days. Table Rock is up to 918.5 feet, so it’s anyones guess on what the generation pattern will be in the near future, but I would not be surprised to say….running. But, both Beaver and Bull Shoals are both above power pool and they are off today. Go figure! Jim, from Florida, back on the river with Stan last Tuesday. Another good day for him on the big ruby and a P&P dropper. Thursday, Jim took Brad and Jennifer out to show them the ropes. Casting is looking good. Boated some fish on the CQ streamer and the red midge. Think they liked it! Stan had David and his son Jordan from Texas out. Their best pattern was the big ruby. Matt and his brother Wes, from Kansas, spent Friday morning on the water with Stan. This was Matt’s first time fly fishing. Good ole big ruby comes though again. Sunday, one of our regulars from the area, Phil brought a friend, Lowell to fish half a day with Stan. Big ruby was the best pattern for them. Carolyn had Sam and his wife, Michelle, out for an instructional trip (second day of the two-day school). A bit tough, but we did catch a few fish on the big ruby and the CQ streamer. Overall, fishing has been a little slow the past few days. 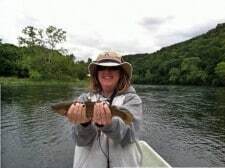 This entry was posted on Monday, June 3rd, 2013 at 12:57 pm	and is filed under Fishing Reports. You can follow any responses to this entry through the RSS 2.0 feed. You can leave a response, or trackback from your own site.